His reign would overlap and compete with the claims of a jostling crowd of rival monarchs: the Hapsburgs, Charles V and Philip II of Spain; the French Valois kings, Francis I and his son Henry II; in England the Tudors, Henry VIII and Elizabeth I; in Muscovy, Ivan the Terrible; in Iran, Shah Ismail; in India, the Mogul emperor Akbar. None would have a keener sense of imperial mission or make for themselves more lofty claims. From the start Suleiman made a powerful and calculated impression on the foreign ambassadors admitted to his court. “The sultan is tall and slender but tough, with a thin and wiry face,” wrote the Venetian Bartolomeo Contarini. “Rumour has it that Suleiman is aptly named…is knowledgeable and shows good judgement.” His countenance was sober, his gaze steady, his caftans simple but magnificent. His height and physical presence were enhanced by the size of the enormous spherical turban pulled low over his forehead, and by his pale face. He meant to impress with the splendor of his person and his court. Soon he would lay claim to the title of Caesar and envisage control of the Mediterranean. He had two immediate victories in mind. Keenly aware of the achievements of his forebears, Suleiman had dreamed, since boyhood, of completing the twin conquests that had eluded his great-grandfather Mehmet. The first was the storming of the fortress of Belgrade, the gateway to Hungary. 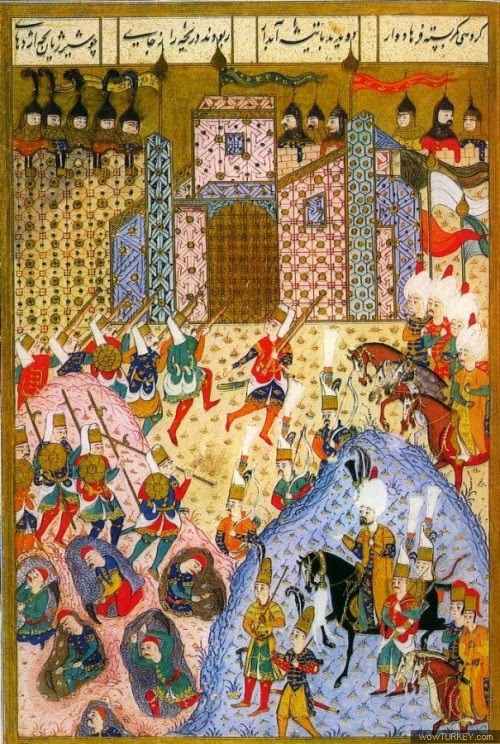 Within ten months of his accession, the sultan was encamped before the city walls; by August 1521 he was saying prayers in its Christian cathedral. The second conquest was intended to advance his claim to be “Padishah of the White Sea.” It was to be the capture of Rhodes. The island to which Suleiman now turned his attention was a strange anachronism—a freak Christian survivor from the medieval Crusades located within touching distance of the Islamic world. Rhodes is the most substantial and fertile of a belt of limestone islands—the Dodecanese, the twelve islands—that stretches for a hundred miles along the coast of Asia Minor. Rhodes lies at the southwest end of the group; the northern marker is the whitewashed monastery island of Patmos, one of Orthodox Christianity’s holy sites, where Saint John the Divine received the revelations of the New Testament. These islands are so closely intertwined with the bays and headlands of the Asian shore that the mainland is always a presence on the horizon. From Rhodes the crossing is a bare eleven miles, just a couple of hours’ sailing time with a smart wind, so near that on clear winter days the snowy Asian mountains, refracted through the thin air, seem almost within touching distance. When Mehmet took Constantinople in 1453, Christian powers still held the whole of the Aegean Sea in a defensive ring, like an arch whose strength depended on the interdependence of each stone. By 1521, the entire structure had collapsed; yet against gravity, Rhodes, the keystone, survived as an isolated Christian bastion that menaced the Ottomans’ sea-lanes and cramped their maritime ambitions. Rhodes and its accompanying islands were held in the name of the pope by the last remnant of the great military orders of the Crusades, the Knights of Saint John—the Hospitallers—whose fortunes closely mirrored the whole crusading enterprise. Originally founded to provide care for sick pilgrims in Jerusalem, they had also become, like the Templars and the Teutonic Knights, a military fighting order. Its members took lifelong vows of poverty, chastity, and obedience to the pope; their cardinal purpose was to wage unceasing war on the infidel. The Order of Saint John had fought in every significant action in the long wars of the Holy Land until they were cut down, almost to a man, with their backs to the sea at Acre in May 1291. In exile they searched for a means to continue this struggle, and their eyes alighted on the Greek Christian island of Rhodes. In 1307 they attacked and captured it. Rhodes became Western Christendom’s deep position against the Islamic world, a launchpad from which a new counteroffensive for Palestine could be prepared at some point in the unspecified future. In the town of Rhodes the knights created a small feudal bastion, a last outpost of the Latin Crusades, subject only to the pope, paid for from the rents on the Order’s huge land holdings in Europe, and dedicated to holy war. The Holy Religion, as the knights called themselves, understood fortified places; they had generations of experience of frontier defense in Palestine. They had constructed Crac des Chevaliers, the greatest of the Crusader castles, and they now fortified the town with bravado and reinvented themselves as sea raiders, building and equipping a small squadron of heavily armed galleys, with which they plundered the Ottoman coasts and sea-lanes, taking slaves and booty. For two hundred years, the Hospitallers maintained an uncompromising piratical presence on the edge of the Muslim world, holding the Dodecanese as a chain of fortified islands to pen in the Turks. The knights even managed to keep a toehold on the mainland itself, at the fortress the Turks called Bodrum—the castle of Saint Peter the Liberator. The fortress served both as an escape route for Christian slaves and as a propaganda tool for raising funds for the Order’s mission throughout Europe. The knights, well aware of the fate that had befallen the Templars, managed their image carefully as the Shield of Christendom. European opinion of the knights was mixed. For the Papacy, Rhodes carried a huge symbolic weight as the outer line of defense against the infidel, manning a maritime frontier in continual contraction as the Byzantine inheritance crumbled before the Islamic advance and one by one the bright ring of islands fell to the Ottomans. Pope Pius II lamented that “if all the other Christian princes…had shown themselves as tireless in their hostility to the Turks as the single island of Rhodes had done, that impious people would not have grown so strong.” Even after the fall of Constantinople, Rhodes continued to nourish the Holy See’s most cherished project—the possibility of an eventual return to the Holy Land. Others were less charitable: to Christian maritime traders, the Hospitallers were a dangerous anachronism. The Order’s acts of piracy and blockades of Western trade with Muslims threatened to destabilize the delicate peace on which commerce depended. The Venetians thought the knights indistinguishable from corsairs and regarded them as a menace second only to Ottoman imperial ambitions.